For the past several months, the Brown-headed Cowbirds have been keeping a low profile--at least in the park that I frequent. But beginning late last week, they have started to reappear in small flocks of 20 to 30 birds. I assume they are banding up to prepare for the trek south before the autumn winds begin to blow. Nothing against Cowbirds per se. Every native bird, including the Cowbird, has a role to play. 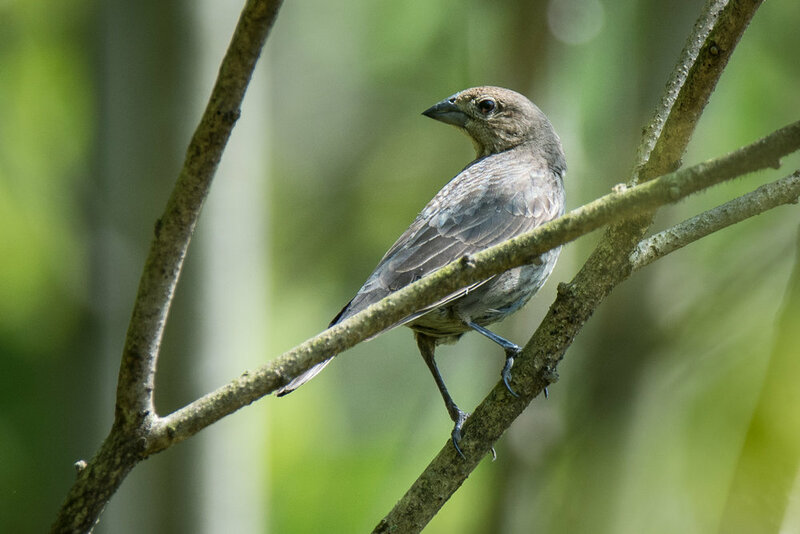 Unfortunately, as farms replaced forests across the US midwest in the last century, an ideal environment was created for the Cowbird to flourish. Their numbers and range have increased so dramatically that they are causing serious harm to many other species--even pushing some species to the brink of extinction. Here's how. They don't hatch and raise their own young. Instead, the female Cowbird lays her eggs in the nests of other birds. Then the unsuspecting parasitized bird proceeds to hatch and nurture the Cowbird chick as if it were its own. Picture a tiny warbler being driven to exhaustion just trying to satisfy the voracious appetite of a chick twice its own size. It's not hard to see the negative impact this can have on the Cowbird's target hosts. 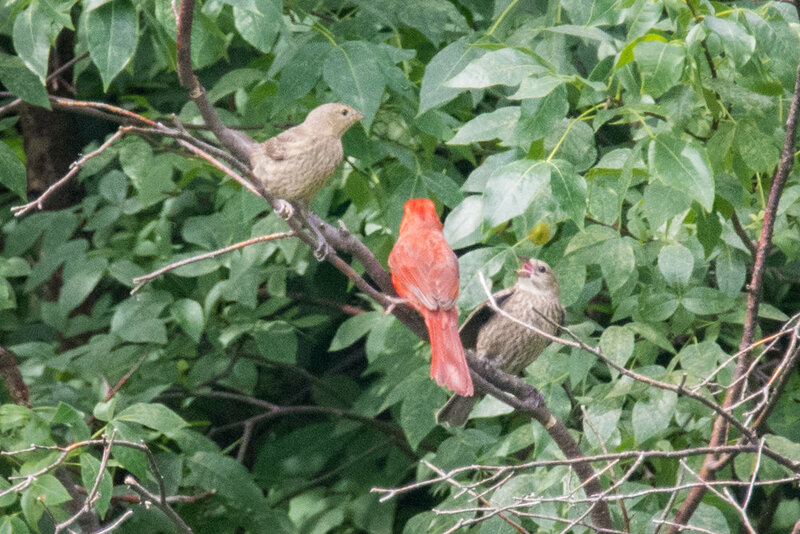 An altruistic Cardinal feeding two Cowbird fledglings--expending all its energy for the continuation of another species. But hey, everyone's gotta make a living. When I see a Cowbird, I try to take the hopeful attitude of the weak-kneed Constable in Gilbert and Sullivan's Pirates of Penzance. I'm sure there's a warm heart beating somewhere under those cold gray feathers. And the bright side is that most species figure out ways to cope with the Cowbird's wiles. Plus, more Cowbirds also means more food for the raptors. Silver linings everywhere!